Yes, I know that the title sounds like a topic given to a nine or ten year old at school. But I deliberately choose this as most of my memories with these trees are of the time when I was a child, the time I would love to go back to, in my thoughts. Some of the trees still silently stand and some no more decorate the front yard of my house, but they all have stories to tell about me and my childhood. So let me just pick the favorite of mine first. The chikku tree in our front yard had one special thing. 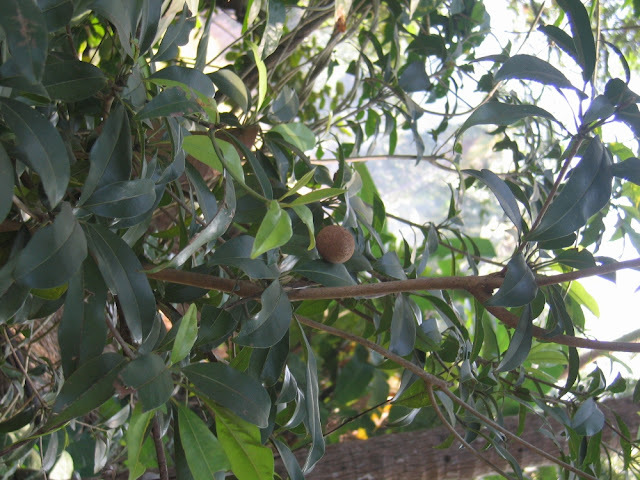 Till today (20-25 years after it was planted) we have not tasted one single fruit from the tree. Few tender chikku’s were seen in the beginning but they vanished with time. Culprit – Squirrels. But my memory with the tree has nothing to do with its fruits. Anupama (my cousin) & I had one favorite time pass during holidays - fooling her little brother Krishna. I would climb the Chikku tree and sit there, hiding between the leaves. Anupama would convince Krishna that she & I were friends with a ghost that lived on the Chikku tree and it would provide us diamonds and gold if made a wish. When did so I would slowly drop an artificial jewelry (Mostly the buttons from my Kurta which had some polished stone). 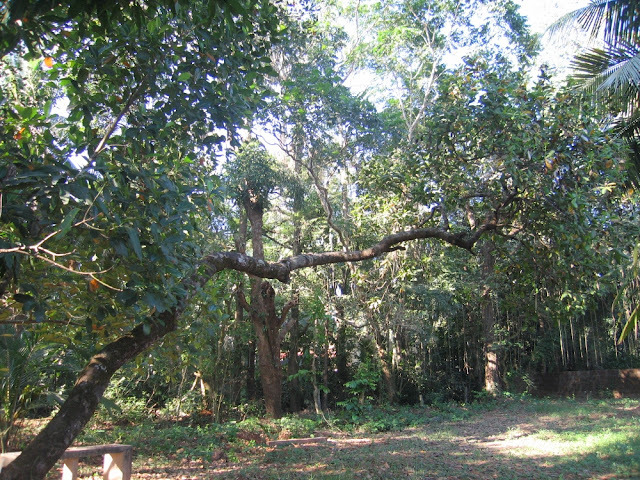 The cashew tree in our compound was my other favorite study place. I used to sit on one of its branches while studying for exams. This tree was right next to the path that leads to many houses around. So when our neighbors would pass by, I would drop a cashew nut or sometimes a stone next to them. Some spotted me and smiled or talked but some would just walk away picking up the cashew nut that they had received by chance, without knowing my presence. This was a nice break for me in between the rigorous studies. The flower parijaatha makes its presence in stories of Lord Krishna. 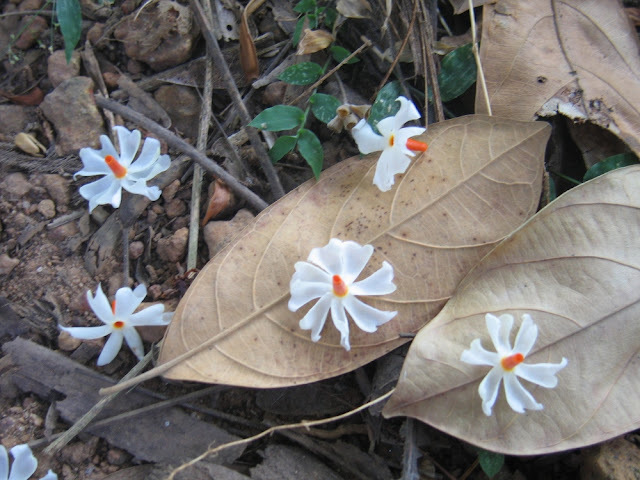 The fragrance of the flower is unique and its appearance lovely; Small white flower with an orange neck. My grandmother (mom’s mother) stayed in our house only once for a long period, which was during my thread ceremony. Early morning she would go to the tree and pluck flowers and make mala out of it. I used to follow her. Even today when I walk there and spot the flowers fallen loosely, unheeded, on the ground, I recall those moments with amma-amma (Grandmother). Banyan tree till date remains my favorite tree. My most relished childhood memories are with this tree. I used to enjoy swinging with the roots that break loose off the tree. The tree was at a certain height and we would catch hold of its root to glide and fall on to the ground. My sister and my relatives would cook dishes beneath the tree by stealing some oil and vegetables and they would even bake the already baked biscuits. 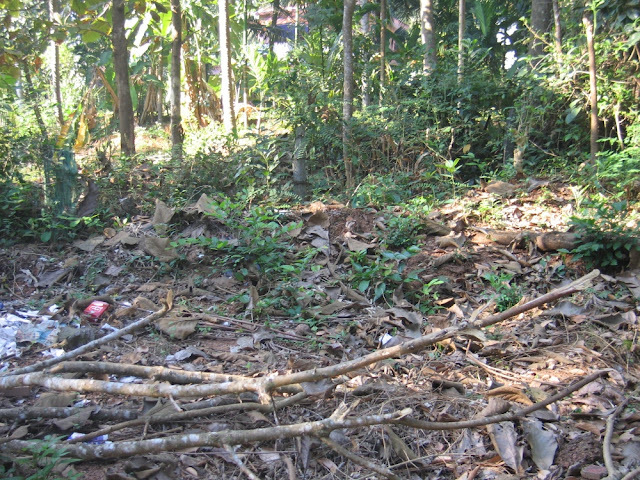 :-) I was sad when tree was cut; they say the roots of the tree travel distance and may be dangerous to the foundation of the house. I was too young to notice such reasons, to me it was end of lot of fun; end of the pride with which I used to impress the little guests to my house. At my grandma's place last time, we had these ciku, starfruit, kuini and but what i loved most ~ the rambutans... i still remember, when it was rambutan season, me n my cousins with my late grandma will pluck our rambutans with this long pole with a blade on it. that was pure 20-25 years back but i still love the scarlet furry rambutans with white juicy flesh.. yummy!! You a mischievous fellow !! Ha Ha... You made me nostalgic with this post. 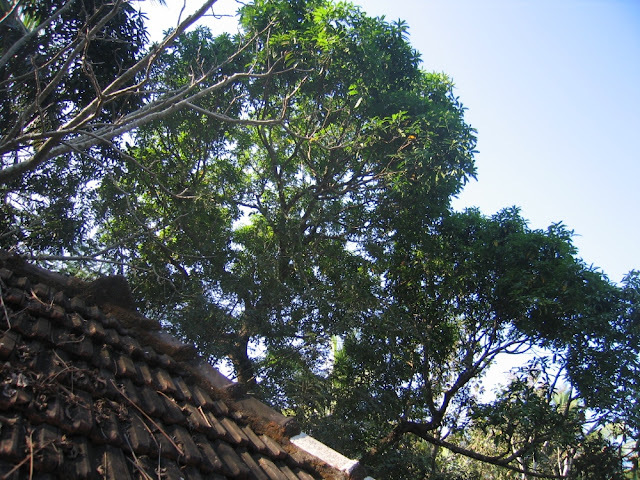 I have also done so (my fav also being Guava tree).. We had to go to our grandfather's place (during summer vacations) to have this big surroundings. I am so jealous of you to see you have so many lovely trees around your house & you have such beautiful memories. We hardly had any trees around our house. I could only only remember a Banyan tree where we used to play around & it still remains with all the beautiful memories....you have made us nostalgic with your post! we dont have guava and mango in my country. all are imported and expensive. u know how lucky u were? I am very fond of tress, plants and flowers, so loved the post! 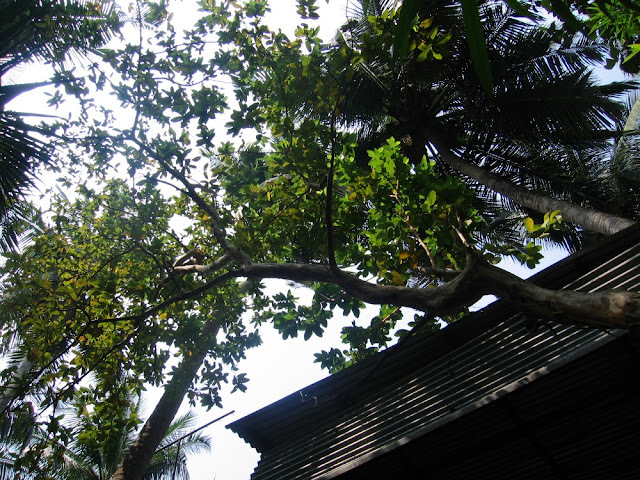 My favorite part of my grandmother's house is the amount of coconut trees she had - and the milk in it tasted delicious! @Drama Div- Isnt that the most beautiful times we have spent?...childhood. @Cuckoo - :-) Wait for the next. @Kalyan - :-) Ya banyan trees are real fun. @Backpacker - Ya its really fun...its now wen i live in a house in Bangalore that hardly has any plant around, i recall my bonding with these trees and somany aspects of it. @Niki - :-)) Ya now i know how luck i am. @Mridula - Glad you liked the post. So have you done similar things during your childhood? You have got me all nostalgic with this post. I especially love the Parijatha. Its white/beige flowers with their bright orange coloured tubes brings back childhood memories. I have seen your comments on Cuckoo's post and from there I hopped some time back - loved this post and since that day I was short on time I am coming back and leaving my comments now. I really love trees and plants and since I love taking pics of flowers - i found your pic of fallen parijatha on dry leaf very nice. In your second post as well you have mentioned about another fragrant flower starting with S - however there was no pic of flower ( I have a feeling it could be frangipani) is it possible for you to post that pic as well sometime. No doubt you were really lucky in your growing years to have such wealth around you. Growing in desert area - alas no such Tree...except a one big local tree which was our best hangout...! Good fun post. Thanks for very detailed text. We are state certified tree nursery specializing in native plants and garden trees, shrubs, fern, and perennials as well as pond plants and wetland mitigation species.